The grueling Transsyberia Rallye is a 6,200km test of man and machine that starts in Moscow and snakes through the Siberian tundra and the scorching Gobi Desert before ending in Ulaanbaatar. Many of the rally's participants chose to use the Porsche Cayenne Transsyberia, which was specifically modified by Porsche for the event. 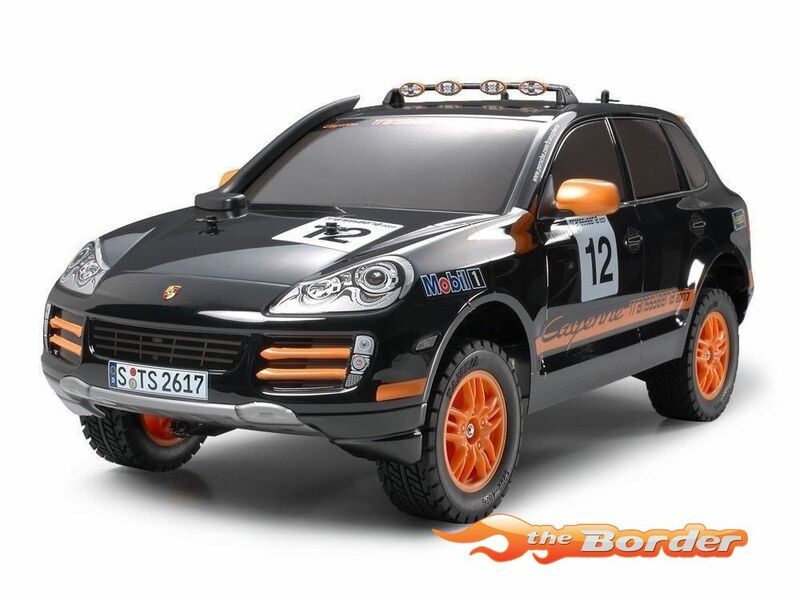 Tamiya has accurately reproduced this custom SUV as an R/C assembly kit. The distinctive body shape is recreated from lightweight polycarbonate and details such as side mirrors, roof light bar, rear wing, and snorkel are all separately-molded to ensure the highest detail. Orange-colored slit-spoke wheels and body trim round out the stylish package. Reliable shaft-driven 4WD system enables both on-road and off-road driving to match the image of this rally-style SUV. Fully-enclosed front and rear gearboxes are equipped with differential gears for smooth cornering. 4-wheel double wishbone suspension features oil dampers for excellent shock absorption and large 90mm diameter tires provide ample traction.